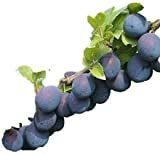 Plum tree for sale in the market is either a grafted rootstock or a container-grown tree. 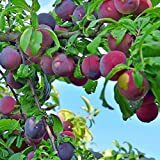 It is best to buy more than one type of plum tree for your garden for cross-pollination to occur. Although, some plum tree cultivars can produce fruit on their own. In addition, plum trees are widely adapted, more compact, and require less treatment than most fruit trees. The fruits can be used for eating or for cooking as well. Location – Select a site with full sun. 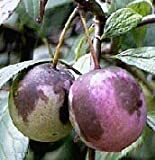 Avoid planting in low areas where frost may settle because it can damage your plum. If the area permits, find a sheltered position that will help the plum tree to set fruit. Plum trees can also be planted in containers for easier transport when winter season comes. Soil – Work on the soil prior to planting. Plum trees need fertile, well-draining soil in order to thrive. You may add compost to the soil. However, do not add aged manure to your planting hole as this can damage the roots of your plum tree. Planting – Dig a hole that is a few inches deeper and wider than the roots. Create a small mound of soil in the middle of the hole and set your tree on top of it. Spread the roots away from the trunk. For grafted trees, keep the graft union 1 inch above the soil line. Space standard-size trees 20 to 25 feet apart. Water – Water young trees heavily every week during the first growing season to help facilitate growth. You may water regularly thereafter. Irrigate deeply at the soil line and let the soil dry out before watering again. Water your tree well into mid-October to give it plenty of moisture through the winter months. Fertilizer – Avoid feeding young plum trees until they have set a crop. Fruit production requires fertilizing all year long. Fertilize with one pound calcium nitrate per tree. Decrease the nitrogen in fall and winter to discourage new growth in those seasons. Pruning – Thin your plum tree to prevent branches from breaking under the weight of the tree. Prune the broken branches back into the undamaged wood. Do your pruning in the early spring or mid-summer to avoid infection. For young trees, the best time to prune is in the spring and mid-summer for matured established ones. Harvesting – Plums are best flavored when left to ripen on the tree. The fruit usually feels soft when ready to be picked and should come off the tree easily when you are using only a slight twist. Plums should be eaten at once or preserved as the fruit does not store for too long. You may pick them while they are still slightly firm and store in a cool place (refrigerator) until they fully ripen. This way, plums will stay fresh from 2 to 4 weeks. You can also make jams or jellies or dry the plums as prunes.